Wow! I'm still overwhelmed today. 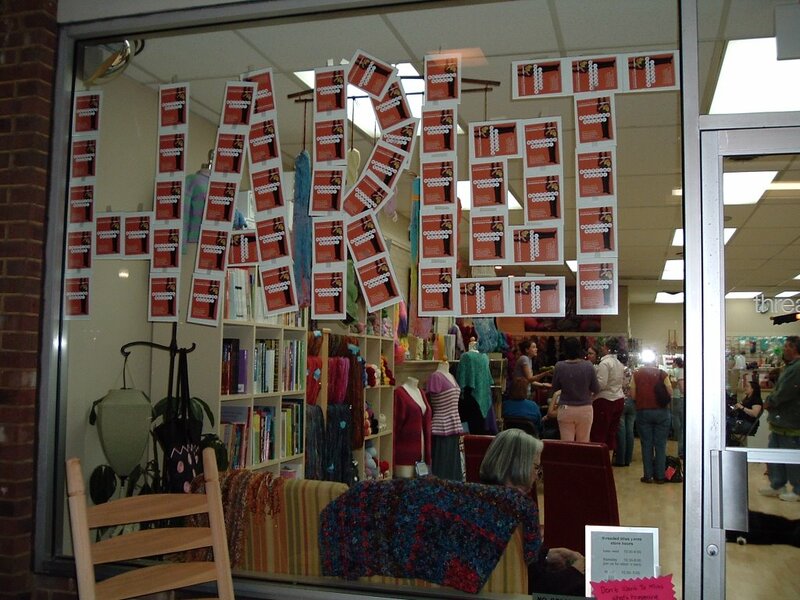 We drove on up to Threaded Bliss Yarns in Brentwood, TN and saw The Harlot. I have the best husband in the world. I told him about the upcoming event on Wednesday and how I wished we could go. Money is tight, but he just brushed past this little detail, broke out the plastic, bought me At Knit's End and Knitting Rules, and then on Thursday he drove me on up and we had such an amazing time. As soon as we decided to go, I immediately became nervous, because, well, that's just the kind of girl I am. 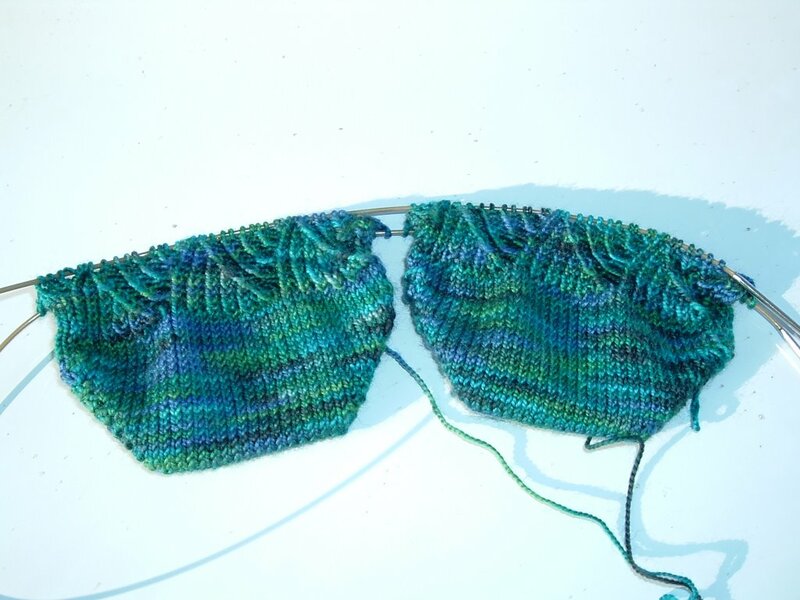 I started on a pair of Pomatomus (I'm working them toe-up) and tried to relax a bit. I could only manage about 90 minutes of restless sleep the night before. The entire experience was just unreal. I can't even begin to find the right words. Stephanie is so funny and nice. I confess, I was star-struck. I was so nervous, I sweat horribly, so I became more nervous and sweat even worse. The whole evening was incredible. 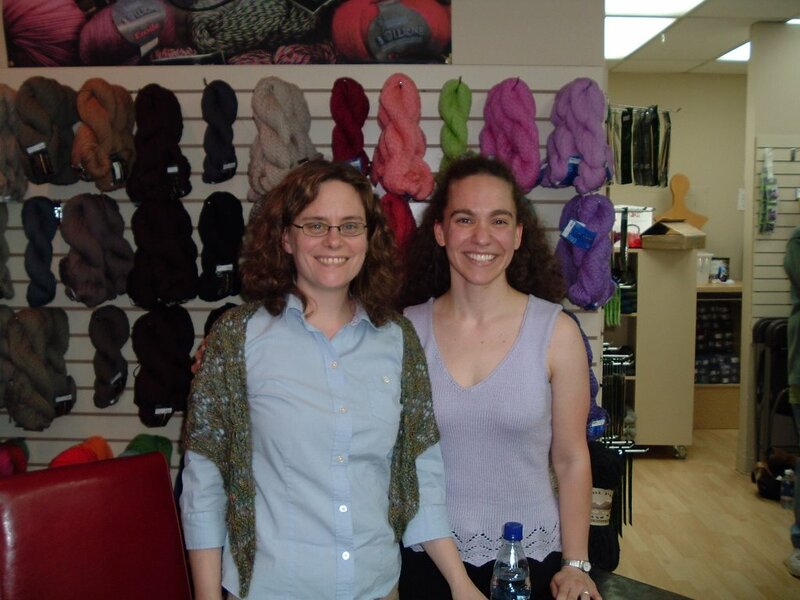 We had another knitting celebrity to introduce Stephanie. 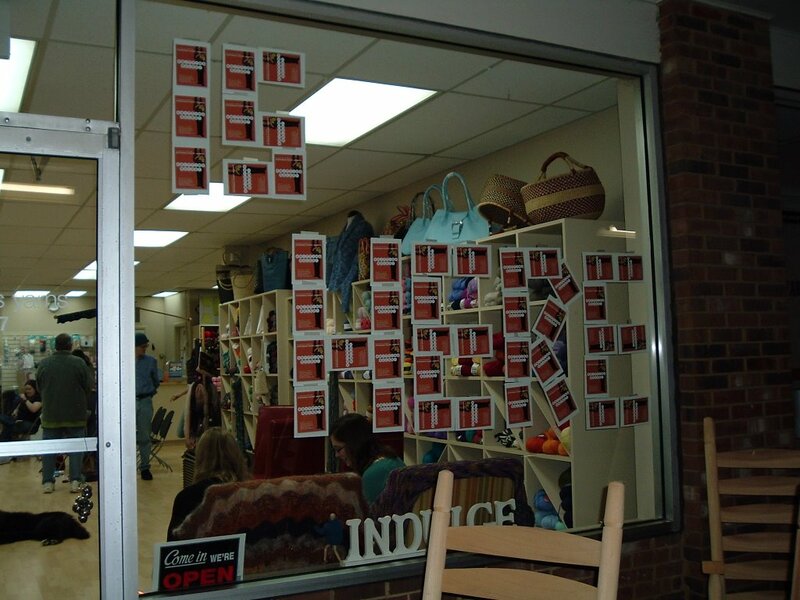 It was Ann of Mason-Dixon Knitting fame. Harlot gave a great talk. She is a riot, and so cool. Then it was book-signing time. I was self-conscious and stumbled over my words, but she was great. She said she had been here to my blog. I could hardly believe it. She was gracious enough to pose for some pictures. She didn't run away shrieking or pass out when I clumsily put my arm around her. I'm such a sweaty freak. Then she took my picture holding her sock. Zowie! I'm still getting flustered just thinking about it all as I type. Before we left, I apologized to Ann for missing her and Kay when they were nearby at Yarn Expressions. I had been watching my four-year-old nephew, and I knew he wouldn't have been able to sit quietly while his Aunt Sarah got wrapped up in all that knitterly goodness. Everyone there was great. I received kind compliments on my Soleil. After the book-signing and picture taking, it was time to go. We grabbed a bite to eat, and then headed for home. I pulled on a little head lamp and read most of the way. As it turned out, I was not the only person from NAKG to attend. Freda and Tiffany made it, too. The excitement of the night kept me up most of the night and got me up early, too. I'm still reeling from it all. If you have the opportunity to make one of these wondrous Harlot On Tour events, I urge you to attend. It was incredible. I gave in to my impulses. No, I didn't buy yarn. I haven't done that at all this year. I surfed on over to The Knitting Zone. I have looked at this pattern more than once. I like this sort of thing. I was going to buy this when I was out at Mary's awhile back, but she was out of copies. My desire for the pattern lingered in the corners of my mind. A couple of times I wished that I had it because I knew it would be an excellent gift. Out of curiosity last night, I checked out that pattern again with a thought that it might be available for immediate download, and it was. I purchased, downloaded, and printed. Now I just need to dig up all my materials to knit it. I like putting a lace edging on a handkerchief. That was the first self-designed thing I ever did crocheting. I miss that handkerchief. Now that I have this pattern, I can edge more handkerchiefs, but use laceknitting this time. It gives instructions on how to seamlessly join the lace edging. The pattern, Lace-Edged Hanky comes from HeartStrings FiberArts. I feel it will be a jumping off point for other lace-edged handkerchiefs. Now to the justifications. No, I really didn't need to buy the pattern last night. I could have waited until my next trip out to The Knitting Zone. I love to go out there. I know that the goats have had kids since my last trip, and Burrito the burro probably continues to look even cuter as he transitions out of his baby fur. Then again, I know that I saved money by just downloading the pattern last night. If I had indeed made it out to the shop, I know I would have purchased more than just one pattern. Then you factor in what is happening with fuel prices, and I think it's safe to say that I practically made money by buying this pattern online last night. Okay, I'm getting carried away now. 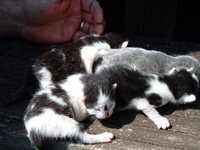 For proof, I offer a picture of the first kittens of the season. I took this picture two or three weeks ago. Join me in welcoming these new kittens' and my husband's first appearance on the blog. 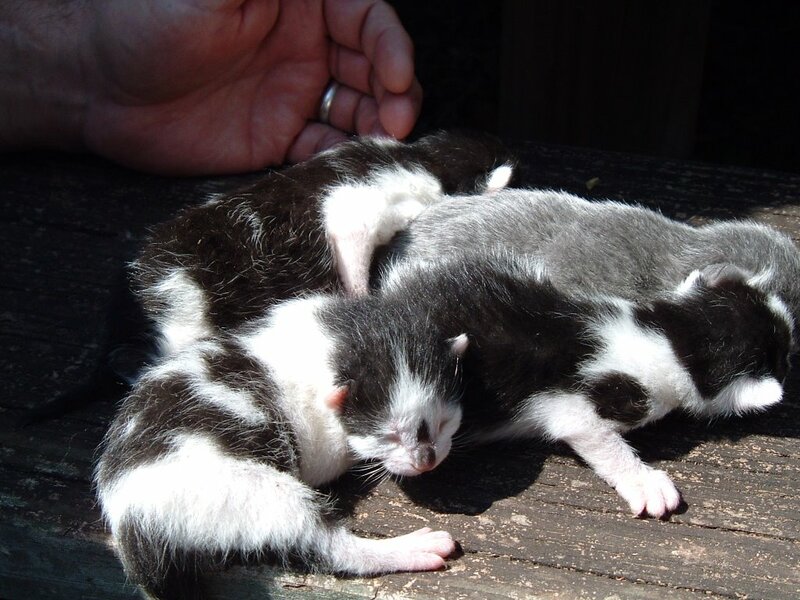 The kittens have been rediscovered under the lawn mower. Guess that means I'll not be cutting the grass yet. Thanks, kitties! They now have their eyes open and they move about a bit. Anyone want a free kitten? Next we have proof that the grass does indeed need to be cut. Atop this is Mary Ann's Cashmere and Pearls Lace Scarf (which I now see has been renamed Angel Pearls Beaded Scarf). This is my second time knitting this scarf, and I love it. I am using the dental floss threader method instead of the teeny-tiny crochet hook method for placing the beads. I think I prefer this way. 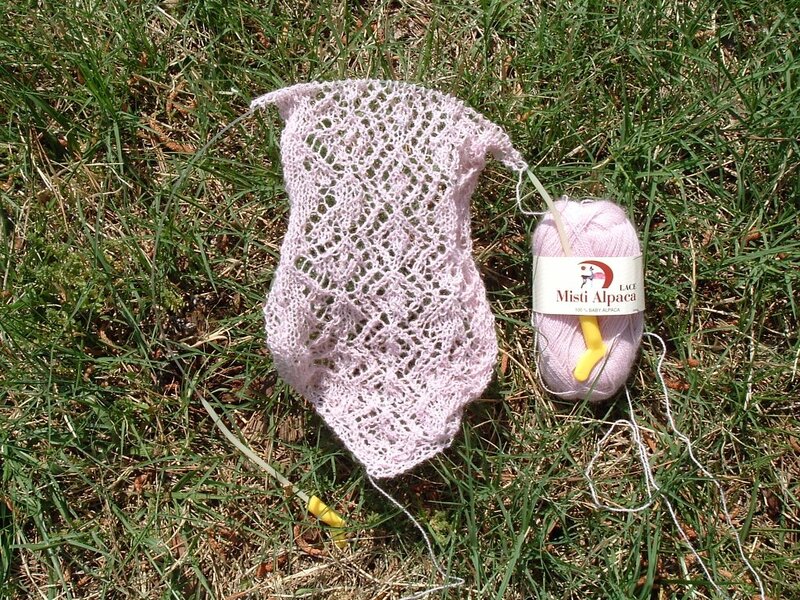 This makes back-to-back lace projects in Misti Alpaca. I've yet to take pictures of my Sheep Shawl that I completed last month. Yes, I know, I'm a bad blogger. Maybe that means I shouldn't sign up for Secret Pal 8. I've been vacillating on this decision for awhile now.